I remember one time I saw the Ragdoll cat breed on TV. It was a talk show, where two rock stars were being interviewed. The host of the show had two beautiful blue-eyed Ragdolls on the couch next to her. At first, that is. When the first commercial break ended, the cats had migrated from the host’s couch to the opposite one where the wild-looking rock stars were sitting. They continued their interview, and when the camera next showed the rock stars completely, they both had a Ragdoll on their lap. And they were both stroking them, and the cats were “smiling” and suddenly the talk was about the cats instead of what the host wanted to ask about. What a sight that was – two content, beautiful Ragdoll cats and two Mr Rock’n’Rolls in heavy makeup, black leather trousers and pointed boots, hair sticking in interesting directions, with purring cats on their laps. The contrast was so hilarious. But that is Ragdoll for you: it loves people, and doesn’t care what you look like. 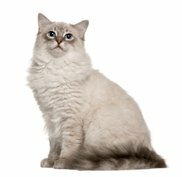 The Ragdoll cat breed is a unique one. Its breeding program started in the 1960’s and the Ragdoll cat has Ann Baker in USA to thank for its existence. Ann Baker had a domestic cat called Josephine - a Persian-Angora-looking white beauty. The kittens were big, had blue eyes and long beautiful coats. Josephine was not Ann Baker’s own cat, so she bought some of these kittens, as she realized they were very special, and started her Ragdoll breeding program. This selective breeding program continued for years to make the breed gentle, big, limp when picked up, and to have pointed coloration. Ann Baker trademarked the “Ragdoll” name and held rights to it until 2005. Only the descendants of Josephine are considered to be real Ragdoll. The Ragdoll cat breed has a very relaxed attitude towards life – literally. They acquired the breed name from the fact that they go all limp and relaxed like a rag doll when they are lifted. This characteristic becomes more pronounced when the cat gets older. 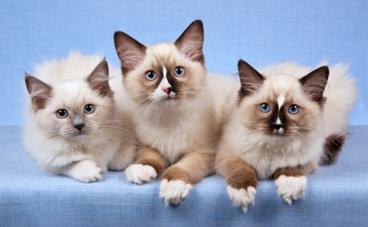 This ragdoll-effect makes the Ragdoll cat breed very popular at cat shows. You can basically flop them on their back and scratch their tummy and they are all content. This relaxed physique probably gave rise to the myth the Ragdoll doesn’t feel pain. But is does, just like any other cat. 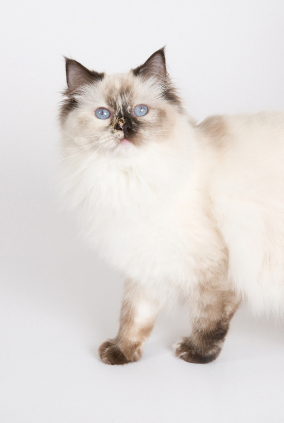 The Ragdoll is one of the most sought after pedigree cats these days – and no wonder. It is docile, kind, placid. It is very affectionate, non-aggressive and gentle. You can say it is extremely docile. It likes to please its humans, so it can also be trained to fetch (especially with rewards, the tastier the reward, the better). It is also a very beautiful, handsome, big cat. The voice of the Ragdoll is pretty quiet, (some call it a chirping meow) but there are some vocal exceptions, yodling like they ran out of the Sound of Music. They may do some yowling if they are lonesome and wish for attention. The Ragdoll loves company. So it would be best if it could have a cat companion. But cat companion or not, they still enjoy conversing with you. The ragdoll cat breed is very people-oriented. Really. You come through the door – there your Ragdoll is, ready to greet you. They sleep in your bed if you allow (and even if you don’t, which may make the space a bit crowded). The Ragdoll is also a good first cat - just remember it will grow quite big. The Ragdoll cats are called “puppy cats” for a very good reason. They really follow you around like a puppy would – surprising many people just how much a cat wants to be with people. They want to be in the middle of events. They observe everything you do, and obviously think deep thoughts about human behavior while they are at it. They get along well with other pets. And if you have children, this breed is maybe one of the most trustworthy for your kids to be around. They don’t tend to scratch and don’t mind being carried around – but always remember to supervise your children when they are with cats. This is one friendly cat, but a cat nevertheless. But in general it can be said the Ragdoll is very tolerant of toddlers and small children. The Ragdoll cat breed is so affectionate, they consider everyone their best friend, be it a strange human or a dog. They are not very defensive, some say they lack the fight instinct completely. Not a very good thing for an outdoor cat. If you let it out, it can be catnapped for its beauty. Other bad things may happen too – so keep your Ragdoll indoors always. It learns to walk on a leash, so if you wish to go out with your cat, that is the way to do it. You may find your Ragdoll is ready for long walks with you. If however, mishaps happen outdoors, it is best to be prepared in advance, for example with Feline First Aid Kit - Cat. Not all Ragdolls are lap cats, but they love being held. They love lying on their backs, giving air baths to their tummies, with hind legs wide apart. If there is a sun spot on the floor where to do this, then all the better! The Ragdoll cat breed certainly has a sense of humor too, which you will certainly get to know if you choose to be owned by a Ragdoll. So if you are looking for a beautiful, big cat which devotes itself to you, and don’t mind having an affectionate “puppy-cat” following you around where ever you go, the Ragdoll cat breed is the breed for you. Here is more information about the Ragdoll's looks. Here you will find the Ragdoll colors explained. 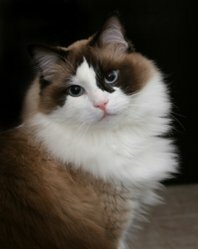 Searching for a Ragdoll breeder? Click here! Looking for Ragdoll Cat Pictures? Click here! And here is a page for Ragdoll cat rescues to tell about themselves. Do you have a lovable Ragdoll with a relaxed attitude to life and devoted to you? Tell us all about it! Your story will appear on a Web page the way you enter it here (minor editing may be possible - correction of spelling mistakes and such). You can wrap a word in square brackets to make it appear bold. For example [my story] would show as my story on the Web page containing your story. Do you have some pictures of your Ragdoll? Great! Click the button and find the first one on your computer. Select it and click on the button to choose it.